By the end of the next week I just couldn’t cope without a hearing aid and decided it wasn’t an option to wait a minute longer for the NHS to provide me one. Over the last few weeks I’d gone for free consultations with a few private hearing aid centres in my area and had already gathered info on packages and prices. They all seemed to give money back guarantees so I decided to go for it and spend £3,500ish to help me with this new experience of isolating deaf-tinnitus. I was fitted with my new pair of Phonak Q90’s from Boots and was absolutely delighted to hear speech and everyday sounds and not have to be wired up to the Sonido anymore. 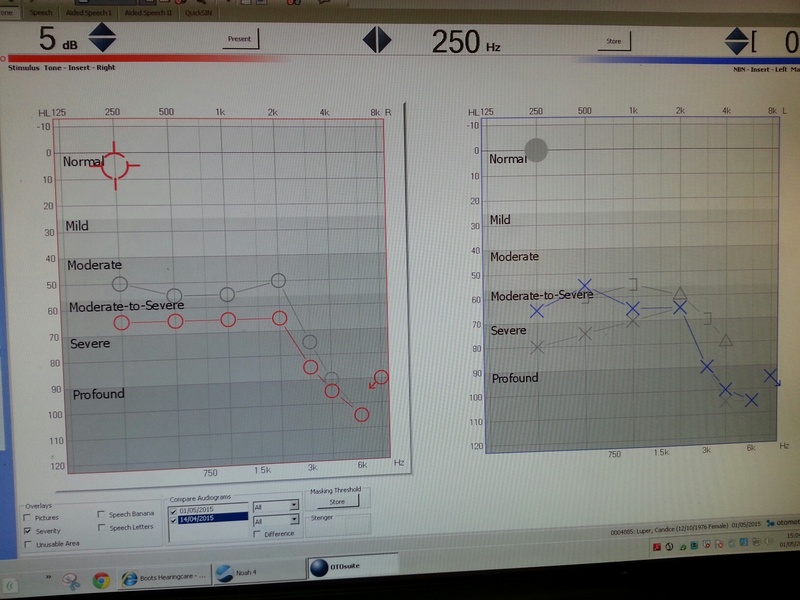 The audiogram confirmed that my hearing had indeed dropped since my previous audiogram 2 weeks earlier. Thanks NHS for all your help and all your efforts to save my hearing! I headed over with my new techno-ears and my family to get the news of my scan results from the ENT. We prayed in the car. We prayed in the waiting room. And when the ENT informed me that my scans were all clear we hugged, celebrated and shed a few tears. It’s funny how nothing actually changed – I’m still severely deafened, unable to see straight, or work, but that we celebrate the non-negative possibility. Maybe this is the way to spread joy in the world and reduce depression. We could announce to (perfectly healthy) people that they are terminally ill and then a week later, tell them they are cured! we can fill peoples hearts with joy and gratitude! The ENT refused to discuss the lack of response I had to my hearing loss. He said the NHS were very good and everything was just fine. When I questioned him about why my sudden hearing loss hadn’t been treated, he said “sudden hearing loss is when you lose ALL your hearing. Since you still have some left it doesn’t count as sudden hearing loss”. That’s just absolutely false – another one of his flawed and inaccurate statements that make me want to check he is actually qualified in medicine. He then went on to say that my hearing loss hadn’t changed since my first audiogram! I took a deep breathe and acknowledged the futility of trying to make progress with this man. He referred me to physiotherapy (why couldn’t this have been done a month earlier?) and said there is nothing more he can do now; that I would get better in time and I should just wait. When asked what I should do to help myself he said, keep taking the pills, relax and do things like yoga (good choice for someone who has no balance!). I had a plan up my sleeve. Over the previous week I’d been exchanging notes with my GP asking him to refer me to University College London Hospital (UCLH). They have a Neuro-otology Department specializing in vestibular and hearing disorders and I’d seen from forums and blogs that this is where people reported getting proper help. My GP was at first hesitant to refer me without seeing the results of the scans but with extra pushing he agreed to do so. Didyou know that you have a right on the NHS to ask for a referral to a specific hospital? If I had known I would have done this months ago. If you’re in a similar position, I’d suggest searching out your nearest neuro-otologist or department and pushing for a referral. Alternatively there is also the option of going privately and simply paying. UCLH say on their website that they see urgent cases (i.e. sudden hearing loss) within 2 weeks on the NHS. Bingo!